Thank you for the fantastic support and attendance of our Sports Day. The children certainly enjoyed themselves. We had 3 mom and 2 Dads who are our fastest runner’s in the school. I have identified Lilliana’s mom, Chantell; Natanya’s mom Corne and Lusentha’s mom Zanele; as well as Tohar’s dad Christopher but have no idea who the other wining of the dads race is. Please identify yourself, so we can enter you all in our next Olympic Games. Well Done! To celebrate youth day on Thursday, we would like all the children to dress up in Disney/Favourite character costumes. This day will be celebrated as a fun day with games and treats for the children. 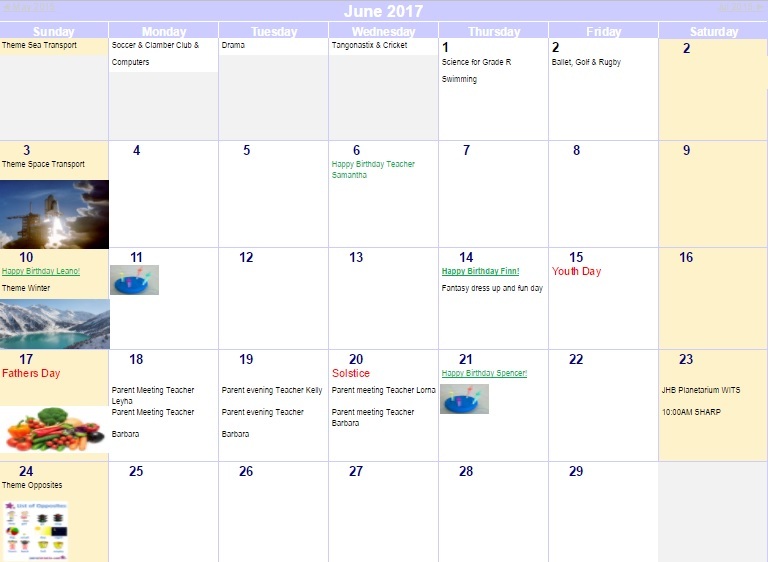 Progress Reports will be sent home from 14 June 2017. The teachers will be available in the afternoon and evening to discuss your child’s progress. A timetable will be displayed outside your child’s classroom in order for parents to book a time slot. The time allocation will be 15min per parent. If any parent would like to have a longer meeting with the teacher this can be arranged. Please discuss this with the class teacher and she will make herself available for the meeting. Winter is upon us and it is the time of year that more children are susceptible to illness. We request parents to become more vigilant with regards to illnesses and symptoms, even if you think it be very minor, consult your family doctor or seek advice from Barbara. Please keep sick children at home to prevent the spreading of illnesses. I have no problem with the children bringing healthy snacks to school, but please refrain from packing foods with a high sugar content, such as sweets, biscuits, chocolate, cakes, chips etc. The teachers have a hard time convincing the children that they cannot eat their sweets/treats as they arrive at school and throughout the day. There are set snack and meal times. Some children then do not want to eat the substantial meals the school provides and by the end of the day the children complain that they are hungry. The school does provide healthy snacks and plenty of food for the children. The problem with eating high sugar content food at school is that it fills them up with unnecessary sugar which makes the children very hyperactive therefore the children cannot concentrate on their school work. It also increases the risk of catching winter flus as sugar compromises the immune system. The theme this week is space travel. This is a great hit amongst the children. We have organize a trip to the Johannesburg Planetarium at Wits University. This will be on Saturday Morning 24 June at 10:00. Parents are to accompany their children. Cost is R35.00 per person. Please inform your class teacher if you would like to attend. I recommend it is best for the 3 year olds upwards. Happy Father’s day to all our Dads on the 18th June. We wish you many blessings for a love and laughter filled day!